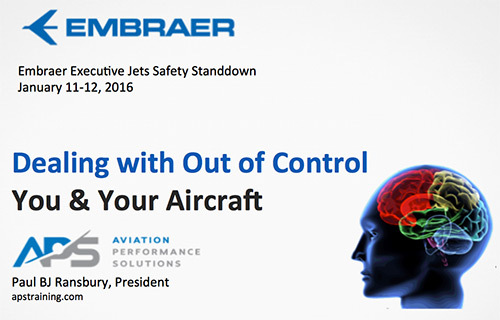 January 11, 2015 – APS president, Paul BJ Ransbury, presented Upset Prevention and Recovery Training (UPRT) solutions to Loss of Control – Inflight (LOC-I) at the Embraer Executive Jets Safety Standdown in Melbourne, Florida. The presentation included the integration of the 2015 NBAA Safety Committee’s Loss of Control – Inflight (LOC-I) video. Topics included Threat & Error Management (TEM), stall escalations, upset prevention and recovery paradox, hazardous mental attitudes, LOC-I intervention strategies / cockpit tools and an open discussion on ICAO, EASA, FAA, IATA, CAST, and GAJSC industry updates. The event was launched by Embraer Safety Officer, Dan Ramirez, and Vice President Flight Operations, Brad Mckeage. After several very well deserved Pilot Safety Awards, Capt. John Cox from Safety Operating Systems (SOS) gave a powerful discussion on the threat of smoke/fire associated with lithium battery fires and their mitigation. Following a detailed Embraer safety analysis of its operations by Dan Ramirez, the post-lunch presentations continue by being kicked-off by APS on LOC-I. 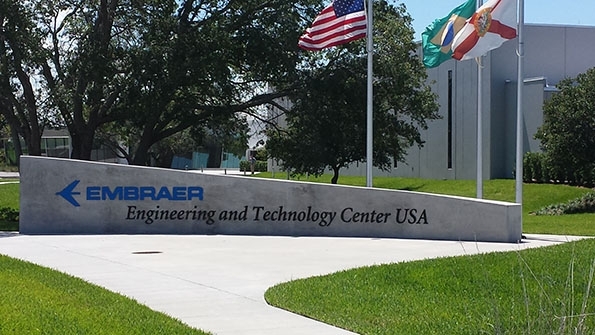 CAE presented on it’s training partnership with Embraer, followed by a very interesting presentation on Hypoxia by Dr. Paul Buza. Flight Safety International discussed their Safety Management System with the group. The day wrapped up with presentations by Aircare, Planeguard, Vision Safe. Planeguard did an awesome lithium battery burn at the end the day that dramatically demonstrated the severe threat of lithium batteries to private and commercial aviation.